The UK's Indian Ocean territory could be being used to interrogate terror suspects in a US facility known as "Camp Justice", MP Tom Brake has said. The Liberal Democrat frontbencher raised the issue during a Westminster Hall about British treatment of the people of Diego Garcia. They were forcibly removed in the 1960s to make way for a US military facility. Mr Brake called for reassurance the base was not being used "to secretly hold and interrogate terror suspects". He described a satellite photo of the base which included "very large hangers". "There are claims that prisoners are being held there by the Americans for so-called 'rendering' which other people have described as torturing, at least holding and questioning before being transferred to Camp X-Ray," he said. Earlier in a statement Mr Brake said there was a "huge question mark" over the use of the facility and he called on the government to reassure the public it was not being used for holding and interrogating prisoners. "The existence of a US airbase on the island of Diego Garcia has consistently brought controversy on the government," he said. "After the recent prisoner abuse scandals in Iraq and Camp X-Ray, the British people have the right to know whether suspects in Bush's War on Terror are being held on British soil. "If they are being held, ministers must make clear under what status and conditions this is happening." Earlier Labour MP Jeremy Corbyn said the base included two long runway and a base for US troops. Giving a history of the base and the removal of the islanders to accommodate it, he said it came about as a result of a deal in the 1960s between Labour prime minister Harold Wilson and US president Lyndon Johnson. The 2,000 people who had lived on the island had been "dumped on the quayside" in Mauritius and had lived in "terrible poverty" ever since despite compensation from the British Government, he said. 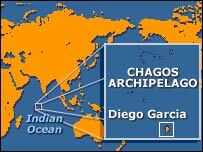 Diego Garcia is the biggest of the Chagos group of islands. Replying to the Westminster Hall debate, Foreign Minister Bill Rammell defended a recent order that denied the islanders a right to return. The order overturned a court ruling in May 2003. Mr Rammell said he did not want to justify the treatment of the Chagosians by past British governments but argued that substantial compensation had been paid to the islanders. He also argued that an independent investigation had found that the cost of maintaining "long-term habitation" was prohibitive. "Is it really realistic and sensible having been presented with that advice to move towards repopulation?" asked the minister. Mr Corbyn demanded to know why the orders to stop repopulation not put up for debate, to which Mr Rammell said there was always going to be time to discuss them.